Obon is one of the most important Japanese traditions. People believe that their ancestors' spirits come back to their homes to reunite with their family during the holiday. For that reason, it is an important family gathering time, as many people return to their hometowns to pray together with their extended family and await for their ancestors' spirits to return. Obon periods are a bit different nowadays and vary by the regions of Japan, but initially were celebrated around the 15th day of the seventh month in the lunar calendar, which is called Fumizuki 文月 or the "Month of Books." In most areas, Obon takes place in August, which is called Hazuki 葉月 in Japanese, or the "Month of Leaves." Obon typically begins around the 13th and ends on the 16th. In some areas in Tokyo, Obon is celebrated in the more traditional month of July, usually mid-month, and is still celebrated on the 15th day of the seventh month of the lunar calendar in many areas in Okinawa. Obon is not only celebrated in Japan but by Buddhists and Japanese-Americans across the world. Before the start of the holiday, Japanese people clean their houses and place a variety of food offerings such as vegetables and fruits to the spirits of their ancestors in front of a butsudan (Buddhist altar). On the first day of Obon, chochin (paper) lanterns are lit inside houses, and people bring the lanterns to their family's grave sites to call their ancestors' spirits back home. This process is called mukae-bon. In some regions, fires called mukae-bi are lit at the entrances of houses to help guide the spirits to enter. Chochin lanterns and arrangements of flowers are usually placed by the butsudan as another offering. Usually, on the second day, another tradition observed is a folk dance called Bon Odori. The styles of dance vary from area to area but usually, Japanese taiko drums keep the rhythms. Bon Odori is typically held at parks, gardens, shrines, or temples, wearing yukata (summer kimono) where dancers perform around a yagura stage. Anyone can participate in Bon Odori, so feel free to join the circle. 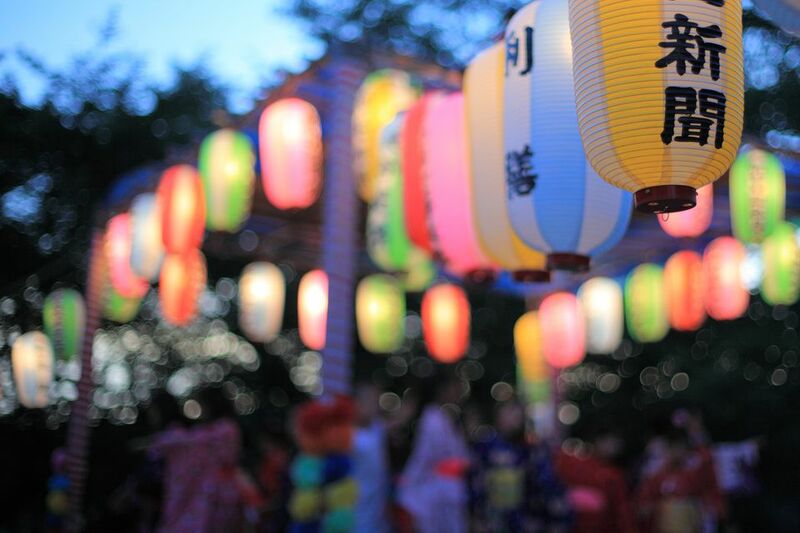 Although floating lanterns have gained popularity globally in the last few years, they are known as toro nagashi in Japanese and are a beautiful part of the traditions observed during Obon. Inside each toro nagashi is a candle, that will eventually burn out, and the lantern will then float down a river that runs to the ocean. By using the toro nagashi, family members can beautifully, and symbolically send off their ancestors' spirits into the sky by way of the lanterns. On the last day, families assist in returning their ancestor's spirits back to the grave, by hanging the chochin lanterns, painted with the family crest to guide the souls to their eternal resting place. This process is called okuri-bon. In some regions, fires called okuri-bi are lit at entrances of houses to send directly to the ancestors' spirits. During Obon, the smell of senko incense fills Japanese homes and cemeteries.